Lately, a lot of folks are asking me the same question, "what flies are working?" We are keeping it simple throwing crawfish patterns in black and brown as well as Clouser Minnows in chartreuse and white. Also, we did manage to catch a few nice fish on poppers this past week when the weather and water temps permitted. Pretty basic patterns are the ticket for winter bass on the Colorado River. My new favorite crawfish pattern is the Lead-eyed Double Bunny Crawfish (AKA "DB Craw") tied on 1/0 — 2X Mustad Signature hook. The two most productive colors are black and brown/orange. As predicted all of my crawfish patterns are tied with with a 25# mono (Hard Mason) weed-guard. In the winter we get a really good run of white bass mixed in with our usual catches of Guadalupe and large mouth bass. We have yet to find a more productive fly for white bass than the Clouser Minnow. 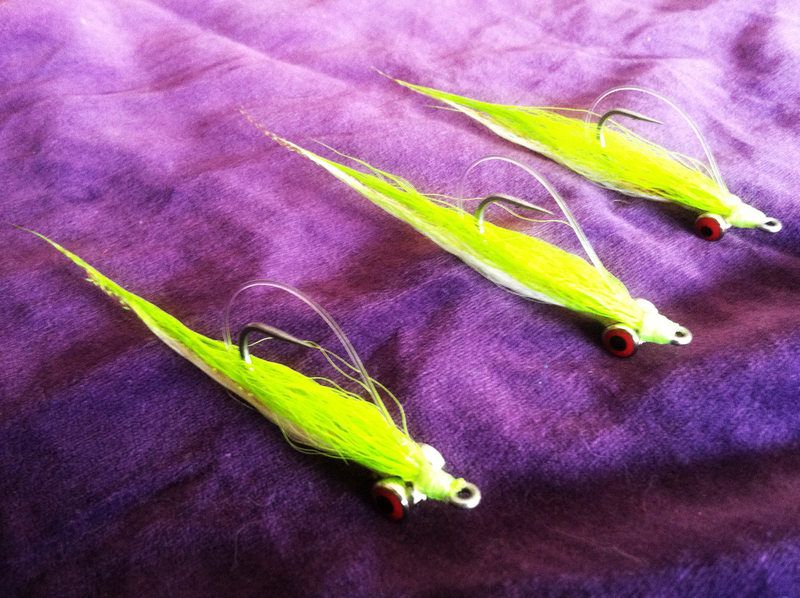 The best color has been chartreuse and white Clousers using 1/32 oz. on lead-eyes tied on a 1/0 — 2X Mustad Signature hook with a 25# mono (Hard Mason) weed-guard. Winter bass fishing is great right now so grab a handful of crawfish and Clouser patterns and your favorite 6-weight the bass are ready and willing!